Corrosion is a problem that is becoming increasingly more common in oil and gas as existing wells age and as producers push into deeper and hotter wells with more aggressive fluids. In the artificial lift industry, corrosion has been around for many years and with significant time and costs associated with corrosion mitigation and, where that is not effective, corrosion related failures. Each year, billions of dollars are spent controlling and working over corrosion-plagued wells. Therefore, producers must be savvy and build a corrosion control plan into their life-of-the-well strategy to mitigate problems and maintain production. 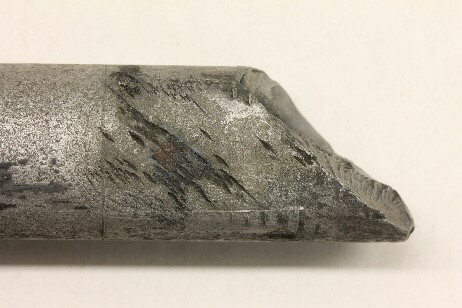 Corrosion is defined as “the deterioration of a substance (usually metal) or its properties because of a reaction to its environment.” This means that a typical piece of downhole equipment like a carbon steel sucker rod is a magnet for corrosion in the presence of water and chemical compounds like H2S, CO2, and O2. Figure 1 Corrosion pits from an H2S attack. A fatigue crack initiated from a corrosion crack that formed at the base of a corrosion pit. Figure 2 Stress corrosion cracks developed from hydrogen embrittlement. Corrosion fatigue to failure whereby a crack initiates on a corrosion pit stress riser and due to the cyclic loading nature of rod-driven artificial lift equipment failure results. Localized corrosion attacks at weld joints. Corrosion causing a reduction in the rod’s cross-section to the point where the rod can no longer carry the load and fails. 1. It can be difficult to get the inhibitor to the pump intake and into the production tubing (i.e. in wells with high fluid levels). 2. It is often incompatible with other downhole well equipment (i.e. the elastomer in progressing cavity pumping wells). 3. In North America’s deviated wells, the rod string often has many points of contact with the tubing, which causes wear. This then causes an inability to maintain the protective film generated by the corrosion inhibitor on the rod surface. 4. Chemical inhibitor is often cost prohibitive, not precise to deploy to targeted locations, and inconvenient to implement / maintain. When embarking on a downhole well-inhibitor program a producer must be ready for a life-of-the-well commitment that requires a lot of ongoing research and testing, given the well changes over time. Special sucker rod materials such as K and D special have been explored for corrosion resistance due to the slight increase in alloying materials. However, often the improvement is incremental in performance over D Carbon and D Alloy as the alloying quantities still remain relatively low. For example, a D Alloy 41-series has 1% chromium, while a K 46-series has 2% nickel, 0.3% molybdenum and a small percentage of chromium. In comparison to a material such as stainless steel that is classified as corrosion resistant, the chromium content is 11% with a high nickel content of usually 8% or higher. Note, stainless steel is not used for sucker rods due to expense, difficulty processing, and the inability to achieve the required mechanical properties. Coated sucker rod involves placing a protective coating on the rod string before deploying downhole. 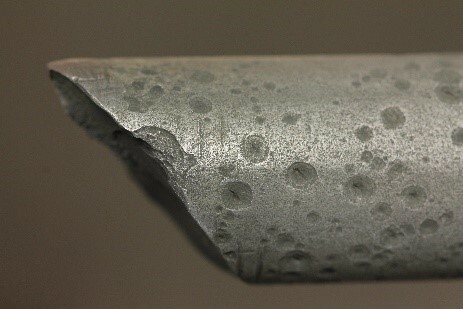 Challenges with coated sucker rod include wear and tear of the coating when servicing and adhesion difficulties. However, when applied properly coated sucker rods are a reliable, cost-effective solution. Lifting Solutions has researched, tested, and designed our Coated Endless Rod® continuous sucker rod to protect against corrosive conditions including C02 and H2s. Our high-strength, proprietary polymer coating is available in various grades and sizes of Endless Rod continuous sucker rod. To ensure product integrity and eliminate wear and tear, Lifting Solutions has engineered fit-for-purpose equipment to service Coated Endless Rod continuous rod without affecting the coating. In addition, Coated Endless Rod continuous rod is environmentally friendly as it has the unique ability to be cost-effectively removed once the coating wears. This allows reuse of the string by re-running the base rod string in a more benign well, thereby avoiding cost. Hambly, Cameron, Derrick Tat, Manvirpal Ghotra, Rob Palmer, and Seongah Kim. "Corrosion of Downhole Components in an Oil and Gas Production Well." Wikispaces. Tangient LLC, 2017. Web. 2 Feb. 2017. <https://oilandgasdownholecorrosion.wikispaces.com/>.